SEO can be a black box, and many business owners have minimal understanding of it. To that end, that’s why you hire a professional to help you out. At the same time, there are many things that agencies wish their clients knew so that progress could be made faster. What is the biggest mistake you see clients making in regards to SEO? “Site structure, most sites can make huge gains by just structuring their internal link structure more naturally. SEO isn’t about keyword usage in your content, it’s about the context of your content. [I]f a client leaves before the end of 3 months (really, 6 months), they are wasting their money. We’d be better off spending their money on a few nice steak dinners. At least they’d get something out of a steak dinner.Theme: treat others how you want your customers to treat you. Content doesn’t have to be ugly, and [sites] with a good quantity of content can still provide a very engaging and attractive user experience. SEO works so, so much better when it can be baked into the site’s design and information architecture. Theme: bring SEO in at the start! Theme: no strategy or a lack of data off of which to determine ROI on their spend. What about you? 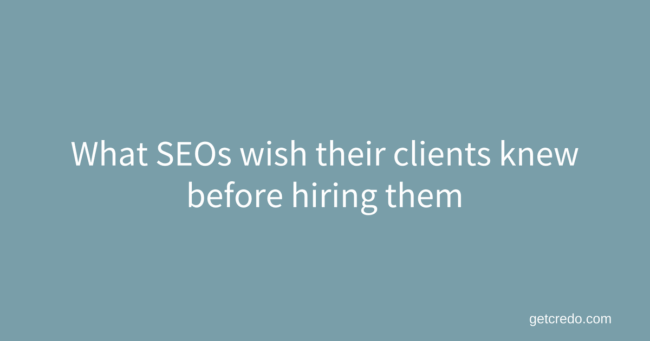 What do you wish you had known before hiring an SEO agency or consultant?